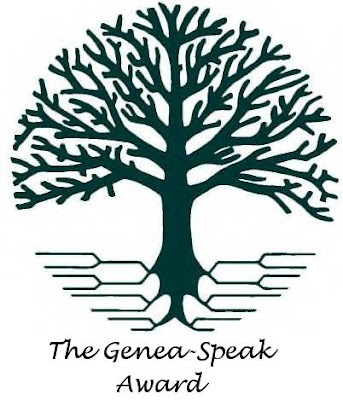 Mountain Genealogists: Very First Ever - Genea-Speak Award! A firm believer that recognition isn't given as often as recognition is due, I would like to award "The Genea-Speak Award" to Thomas MacEntee over at Destination: Austin Family, for excellence in writing, speaking, and the promoting of good genealogical practices. "Thomas MacEntee is a genealogist specializing in the use of technology and social media to improve genealogical research and as a means of interacting with others in the family history community. Utilizing over 25 years of experience in the information technology field, Thomas writes and lectures on the many ways blogs, Facebook and Twitter can be leveraged to add new dimensions to the genealogy experience. As the creator of GeneaBloggers.com he has organized and engaged a community of over 600 bloggers to document their own journeys in the search for ancestors." Recipients of the Genea-Speak Award are required to do just one thing when recieiving their award: They must pass this award onto at least 2 deserving other recipients. Congratulations Thomas MacEntee on receiving the very first ever Genea-Speak Award! Wow. First, thank you so much - I appreciate the kind words and the recognition. Second, I will do my best to stay in the spirit of the Genea-Speak award. I am contemplating my two nominees as we speak! Stay tuned and look to Destination: Austin Family for info later today!